NOTE: This item is the Photo Projector ONLY. The LUCID-Art is NOT included, but it is sold separately on this website. 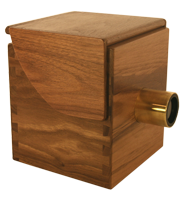 The Photo Projector is an accessory for the LUCID-Art and LUCY Camera Lucidas. The Photo Projector allows you to enlarge Photos, pictures or small objects using your LUCID-Art Camera Lucida up to a 4x magnification. That’s blowing up a 4in x 6in photo to 16in x 24in! (10.2cm x 15.2cm to 40.7cm x 61cm). You can also use the LUCY Photo Projector with the LUCY Camera Lucida to get a 2.5x Magnification. Simple and easy. The image is better then the one you can get with an ordinary art projector: you don’t have to work in the dark, no annoying shadow, no electricity, no risk of damaging your photo with a hot bulb. 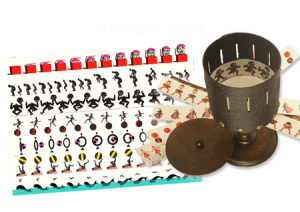 Each Photo Projector (the LUCID-Art and LUCY Photo Projectors) comes with the small stand that attaches to your Camera Lucida and a custom acrylic Fresnel lens that both enlarges and focuses the image, so you get a large clear image that is a joy to copy. The magnification you get with the LUCID-Art Photo Projector is adjustable to anything between 2.5x to 4x original size. And you can also enlarge and project small objects. For example, you could take a 4 inch (10cm) round flower and enlarge the image to 16 inches round (40.7cm)-the possibilities are limitless!